View Poll Results: Choose Your Favourite BIG BAD! the face that is on the armor reminded me of those Visionaries toys that were out in the 80s. 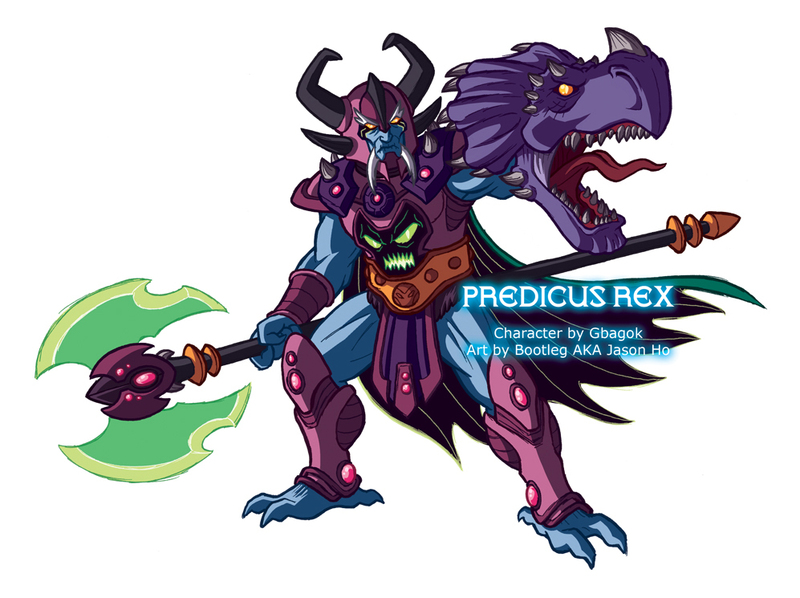 the drawing of Predicus Rex is really something. this character idea should be a main villain in some new cartoon or something. super-munkyboy: you have been emailed, sir! It 's true! don't joke! Brainwave is complete... and its been a year ince the contest, so apologies folks. Predicus Rex will be along soon. hope you like what we did, Patreek! Last edited by bootleg; January 28, 2011 at 01:43am. I think you did the character justice. Patreek has been responsible for the creation of some of my favorite fan characters, some I like more than my own. Brain-Wave was an awesome idea. 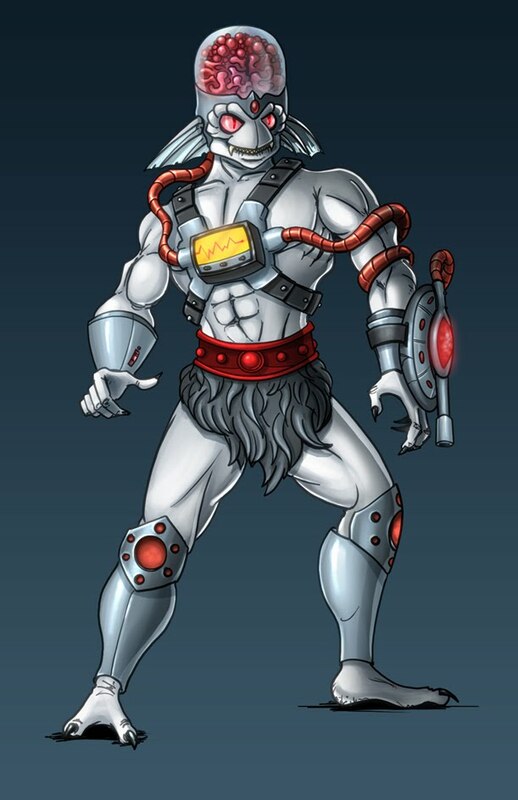 Everything about him fit MOTU, and he was unique enough to really stand out on his own. I'm not sure if Patreek really gets just how fantastic this creation is. If he were to ever make it to figure form, I'd totally scoop one up. Anyway, I was home bored, and recalled a convo I had with Patreek about Brain-Wave. So here is my contribution to the winner. Last edited by Sky Breaker; January 28, 2011 at 03:58am. @Patreek - LOL why am I always SMP? I am SMB!!!! Glad you liked them fella!!! Seems we're all in our insane worlds at the moment. Hope all is well. @Sky-breaker - Nice job fella!!! LOLZ! WOOPS... SMB SMB SMB! I think my fingers get confused and my auto brain gets you and SMPriest jumbled up. Thanks glad you like the stats Patreek and SMB. I recalled that physically he wasn't supposed to be stronger than an average Eternian. The rest was just brain power, so it seemed to fit. The Energy I was going to leave at 1, but I figured with all that brain juice, there has to be some energy being generated somewhere. Also, it makes him look more impressive. What are his abilities again? Super Monkey Pimp.... I like it! Ah fantastic. Water manipulation! Now there is something that opens up a realm of possibilities for fun figure accessories and awesome fan art pieces! Think you will do anything else with him? As you all know, Gbgok is an incredibly talented artist, easily one of the best on the forums, and that's tough competition. I thought it wise to not try to out-Gbagok Gbagok, so my version of his character is a bit simplified, falling in line w/ my usual vintage-style drawings, whereas Gbagok tends to go with the more elaborate 200x style. All times are GMT -4. The time now is 04:32pm.